Eyesight is one of the most important and valued senses we have. Clear vision involves a complex and intricate process of gathering, focusing and translating light into images. As we get older, the eye and its sensitive mechanisms are susceptible to damage and disease. Being alert to changes in vision is important in picking up eye diseases. Some eye diseases such as glaucoma and diabetic retinopathy have no symptoms in their early stages, so you may not know you have a problem till the disease is in its later stage. This can make treatment more difficult and the problem harder to manage. Thus, regular eye examinations are essential for early diagnosis and treatment of any problems that may crop up. Early detection and treatment can slow down or even reverse the progression of eye disease. An eye examination doesn’t hurt. Your eye doctor will usually conduct a basic eye examination which consists of an external check of your eyes, the eyelids and the surrounding areas. Parts of the eye, such as the conjunctiva, sclera, cornea and iris, will also be inspected with a torch and ophthalmoscope for signs of disease. If your child is a premature baby (baby born before the completion of the pregnancy term), then the child should be screened by a retinal surgeon for retinal abnormality (retinopathy of prematurity). If you have a risk factor for eye disease (you have diabetes, high blood pressure, a family history of eye disease like glaucoma, or are taking prescription medications which affect the eyes) you should see your ophthalmologist more frequently. Ask your eye doctor what the ideal interval between check-ups is. Eye pain? Problems with your vision? Excessive tearing or redness in your eyes? Below is a list of some of the common eye symptoms and the possible associated eye conditions. Noting the kind of symptoms you experience is important to help you and your eye doctor find out if there’s a problem. An eye examination can determine what is wrong and how to fix it. Is your vision blurry or distorted? Long-term blurry or distorted vision can have a number of causes. Blurry vision, in particular the inability to clearly see objects that are either far away or up close, is commonly a sign of a simple refractive error like short-sightedness (myopia), long-sightedness (hyperopia), astigmatism or presbyopia . These can be readily solved with vision correction aids such as spectacles, contact lenses and LASIK. A more serious cause of blurry or distorted vision is age-related macular degeneration, which often affects the central vision. Objects in the middle of the field of view are seen as distorted, but the peripheral vision remains clear. This condition is irreversible and can cause blindness if left untreated, so early diagnosis is important. Do you have cloudy vision? Having cloudy vision or having your vision obscured, as if you are seeing objects through a mist, can be a sign of cataracts. This condition, which is age-related, is a progressive condition that can lead to blindness if left untreated. Cataracts can be easily removed, so it is important to diagnose the disease as soon as possible. Cloudy vision can also be caused by other medical conditions such as vitamin A deficiency, sexually transmitted disease and eye tumours. If you are suffering from cloudy vision, do see your eye doctor for early diagnosis and treatment. Are you losing your peripheral vision? Do you have eye pain? If your central vision is fine, but the areas outside your central field of vision start to lose clarity or detail, you could be losing your peripheral vision. Peripheral vision is responsible for detecting motion at the edges of our field of view and sensing incoming danger. Any impairment of your peripheral vision can be quite dangerous. One cause of loss of peripheral vision is glaucoma, where the eye pressure is usually abnormal. The loss of peripheral vision is not always noticed but as glaucoma progresses, it can cause extreme pain and blindness. Early diagnosis and treatment are important to prevent vision loss. Are your eyes itchy or watery? If you are suffering from prolonged itchiness and watering of the eyes, you could have an allergy to pollen, pet hair, or other foreign substances in your environment. The condition can be uncomfortable, but does not usually result in significant vision loss. Your eye may feel irritated and tired. Dry eyes can also cause itch and tearing. Your eye doctor can accurately determine the cause of your eye discomfort and advise treatment. Do you see floaters in your field of vision? The dark, distinct spots you sometimes see in your field of vision are called floaters. Floaters occur when small clumps of the vitreous (a jelly-like fluid) inside the eye detach from the inner wall of the eye. Seeing floaters can be an indication of vitreous detachment, or a more serious problem like diabetic retinopathywhich causes blood vessels in the retina to weaken and burst. The resulting blood that seeps into the eye forms floaters. Floaters can also be caused by retinal detachment, a serious condition when the retina of the eye detaches from the rest of the layers of the eye. If you see floaters, see your eye doctor for early diagnosis and treatment. Flashes appear as arcs of light across the field of vision, or sometimes as flashes of light. Like floaters, flashes are eye symptoms that are commonly associated with vitreous detachment and, more seriously, with retinal detachment. If you see flashes, see your eye doctor for early diagnosis and treatment. There are many other symptoms that can occur due to eye problems. Eye pain can be due to scratches on the cornea or internal pressure, which might signal a dangerous form of glaucoma. If you suffer from excessive crusting of the eyelid, it could be due to allergies or eye infections such as pink eye. If you suffer from any problems with your eyes or vision, see your eye doctor for early diagnosis and treatment. The Eye and How it works? The cornea is a transparent structure situated in the front of the eye that helps to focus incoming light. Behind the cornea is a pigmented membrane called the iris which has an adjustable circular opening called the pupil. The pupil expands and contracts depending on the amount of light entering the eye. The space between the cornea and iris is filled with a transparent fluid called aqueous humor. Behind the pupil is situated a transparent crystalline structure called the lens. The lens is surrounded by muscles called the ciliary muscles which play an important role in vision. When these muscles are relaxed, they pull and flatten the lens, allowing the eye to see objects that are far away. In order to see near objects, the ciliary muscles have to contract causing the lens to thicken, thus enabling clear vision. After passing through the lens, light travels through a jelly-like substance called the vitreous humor, before striking the sensitive layer of cells called the retina. 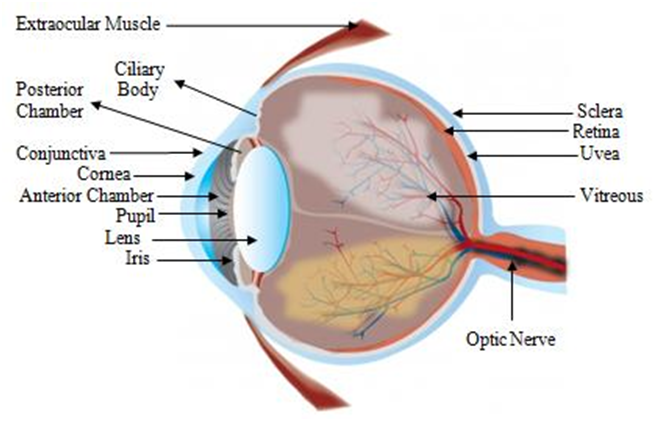 The retina is the innermost of the three layers that make up the eye. The outermost layer is made of a tough protective tissue called the sclera. This is what gives the eyeball its white color. The cornea is also part of the outer layer. The middle layer between the retina and the sclera is called the choroid. The choroid contains blood vessels that supply the retina with nutrients and oxygen. There are millions of light sensitive cells embedded in the retina. They are mainly of two varieties: the rods and the cones. Rods are useful for vision in dim light while cones are used for color vision. Cones are most densely packed in the centre of the retina called the fovea. The fovea is situated within the macula and is the most light-sensitive portion of the retina. When light strikes these light sensitive cells, it is converted into electric signals that are then relayed to the brain via the optic nerve. The brain then translates these electric signals into the images we see. It is a chronic irreversible medical condition that results in loss of vision central because of damage to the macula, or central part of the retina. Age-related macular degeneration (AMD) is a major cause of blindness in those over 50 years old. The condition can make it difficult to read or recognize faces, although enough peripheral vision (vision outside the central area of your gaze) remains to allow you to continue with other daily activities. However, driving and reading will be affected. Age-related macular degeneration (AMD) occurs in ‘dry’ and ‘wet’ forms. In dry AMD─the most common form─the light-sensitive cells in the macula slowly break down, blurring central vision in the affected eye. The exact cause of dry AMD is unknown, but the condition develops as the eye ages. In the ‘wet’ form, abnormal blood vessel growth in the eye leads to the leaking of blood and proteins into the sensitive cells (called photoreceptors) in the macula, damaging them and causing vision loss. The wet form is the condition in its advanced stage. What puts me at risk of Age-Related Macular Degeneration?